One study found that the first "found" flash drive was plugged-in within minutes, and that the usage of the planted flash drives was greater than 100%. HUNTSVILLE, AL, October 22, 2018 /24-7PressRelease/ -- Computer system security calls for protecting software and hardware against damage, theft, contamination, and the misdirection or disruption of the vital functions that our information systems perform. Unfortunately, most organizations have left the front door of cybersecurity not only unlocked, but also wide open. Why is this a problem? Several studies have shown that most employees won't hesitate to use unidentified USB flash drives and storage devices both at home and at work. Even more common is the frequency with which employees use corporate USB ports to charge their smart phones – exposing companies to the malware and viruses those phones contain. One study found that the first "found" flash drive was plugged-in within minutes, and that the usage of the planted flash drives was greater than 100%. In other words, not only were all the research decoy drives used in the agency's data system, but many were used more than once. The Connectivity Center offers an array of products that help organizations barricade the front door of cybersecurity, and these products are available today. The company's hundreds of computer system security solutions include the Smart Keeper collection of computer and laptop security devices, which protect the USB ports through which some of the biggest, most historic cyber-attacks were perpetrated, and where even casual contamination occurs somewhere every hour of every day. 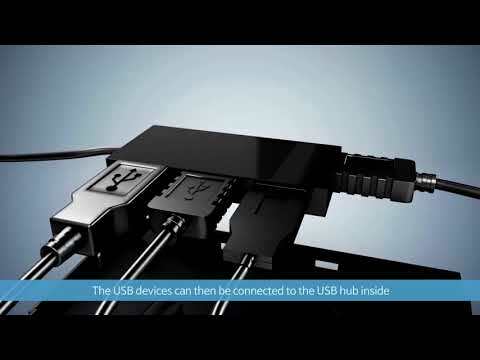 The company's Link Lock connectors and the Link Lock Hub serve not only as secure USB connections, but also lock your devices so that they cannot be removed without authorized access. The Link Lock Hub is secured using a Smart Keeper USB Port Lock Professional in conjunction with a Smart Keeper USB Port Lock Key.